Criticism and condemnation rained down on U.S. Rep. Ilhan Omar Monday after she tweeted "It's all about the Benjamins baby" to explain why she and fellow Democrat Rashida Tlaib draw attention for their "criticisms of Israel." Who is the source of this slang reference to cash? "AIPAC!" Omar added, referring to the American Israel Public Affairs Committee. It's the latest in a series of statements by Omar, tarnishing her status as the first Somali immigrant and one of the first two Muslim women elected to Congress. 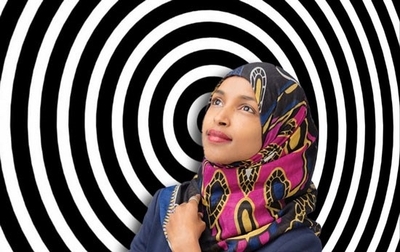 During a 2012 war between Israel and Hamas in Gaza, Omar complained that Israel "hypnotized the world" and prayed that "Allah [would] awaken the people and help them see the evil doings of Israel." Given Omar's own words, then, Israel and its supporters have the eerie power to cloud people's minds. And when that doesn't work, they've got all that Jewish money to buy people off. All of these offending statements remain on her Twitter feed. Plenty of people have tried to defend Omar. The Council on American-Islamic Relations (CAIR) issued a statement Monday acknowledging that anti-Semitism is real, but Omar hasn't engaged in it. The real bad actors, to CAIR, are Israel's supporters. "CAIR applauds Reps. Ilhan Omar and Rashida Tlaib for their courage in speaking the truth about Israel's racial, religious and ethnic segregation. Agenda-driven groups -- like AIPAC -- have for decades enabled that segregation and the resulting denial of human rights for Christian and Muslim Palestinians." Thankfully, the House Democratic Leadership properly rejected that thinking and any semantic debate in a statement issued Monday afternoon. Omar's comments are anti-Semitic, the statement House Speaker Nancy Pelosi and other leaders said in its headline. "Legitimate criticism of Israel's policies is protected by the values of free speech and democratic debate that the United States and Israel share," the statement said. "But Congresswoman Omar's use of anti-Semitic tropes and prejudicial accusations about Israel's supporters is deeply offensive. We condemn these remarks and we call upon Congresswoman Omar to immediately apologize for these hurtful comments." And she did later Monday afternoon, with a "yeah, but" clause: "Anti-Semitism is real and I am grateful for Jewish allies and colleagues who are educating me on the painful history of anti-Semitic tropes," she wrote. "My intention is never to offend my constituents or Jewish Americans as a whole. We have to always be willing to step back and think through criticism, just as I expect people to hear me when others attack me for my identity. This is why I unequivocally apologize." But then she equivocated, saying she has a problem with "lobbyists in our politics," including AIPAC. Her message was strikingly similar to an apology she made last month about Israel hypnotizing the world. She had no idea that claiming a mystical power to control the earth "was offensive." She is "not criticizing the people ... their way of life," she said on the "Daily Show." After the initial storm from Sunday's "Benjamins" and "AIPAC!" tweets, Omar retweeted several people standing up for her. One, HuffPost writer Ashley Feinberg, wrote that "accurately describing how the Israel lobby works is not anti-semitism." Less than 24 hours later, Omar apologized, acknowledging the reality of anti-Semtism. What does she really believe? She seems to admit she has a lot to learn about basic elements of religious bigotry. It raises the question whether the influential Foreign Affairs Committee is the best place to sit while pursuing that education. Still, it's a mistake to dismiss Omar's statements as poorly worded "criticisms" of Israel by a political novice. She was savvy enough to advocate a two-state solution to the Israeli-Palestinian conflict during her primary campaign last summer. She also said she opposed the anti-Semitic Boycott, Divest and Sanction (BDS) movement that aims to isolate Israel economically and socially during her primary campaign. BDS wasn't helpful in reaching that two-state solution, she said. Once safely elected, however, she reversed course, with her office saying she "believes in and supports the BDS movement." In December, we thanked Zahra Billoo, one of CAIR's most strident voices, for her candor. Billoo will come right and say she doesn't believe Israel has a right to exist. So when she says, "From the river to the sea, Palestine will be free," there's no room for doubt that she wants the world rid of its only Jewish state. In some ways, Omar is bringing that same level of candor to Washington. It is abhorrent and hateful, but it helps pull the veneer off so many voices which claim they merely oppose Israeli policies, or criticize its government. The basic ideology is the same – Israel stands alone as the problem. Israel alone must be ostracized and condemned. Hamas, Hizballah and Iranian clerics who devote millions of dollars to destroying the Jewish state instead of investing in ways to improve life for Palestinians, merit no mention. Remember that the next time Ilhan Omar apologizes for something else she needs to learn.